AVONDALE, Arizona (Saturday, April 7, 2018) – Armed with a fresh set of tires, Josef Newgarden charged from fourth place in the last seven laps to win the Desert Diamond West Valley Casino Phoenix Grand Prix going away. The defending Verizon IndyCar Series champion beat rookie Robert Wickens by 2.9946 seconds on the ISM Raceway 1.022-mile oval to collect his eighth career victory. Newgarden, in the No. 1 Verizon Team Penske Chevrolet, was among eight lead-lap drivers who made a pit stop for a new set of Firestone tires during the race’s second caution period when Ed Jones hit the Turn 4 SAFER Barrier on Lap 229 of 250. Wickens, Schmidt Peterson Motorsports teammate James Hinchcliffe and Andretti Autosport’s Alexander Rossi elected not to pit and led the field on the Lap 243 restart. Taking the restart in fourth place, Newgarden immediately roared past Rossi and Hinchcliffe on the outside through Turns 1 and 2 before setting his sights on race leader Wickens. On Lap 247, Newgarden again took the high line into Turn 1 and maneuvered past Wickens, driver of the No. 6 Lucas Oil SPM Honda. Rossi, in the No. 27 MilitaryToMotorsports.com Honda, finished third. With the win, Newgarden also took the championship lead after two of 17 races. The seventh-year INDYCAR driver has 77 points, five more than Rossi and seven ahead of Sebastien Bourdais, winner of the season-opening Firestone Grand Prix of St. Petersburg. “I think we were a top-five car tonight, for sure,” Newgarden said. “But I struggled a little bit with the balance, so it was difficult for me to force the issue until we got to the end when I had a tire advantage. Bourdais, who started from the pole after winning the Verizon P1 Award in qualifying on Friday, and Rossi were penalized for hitting crew members on their first pit stops. The ensuing drive-through penalties put each driver a lap down. 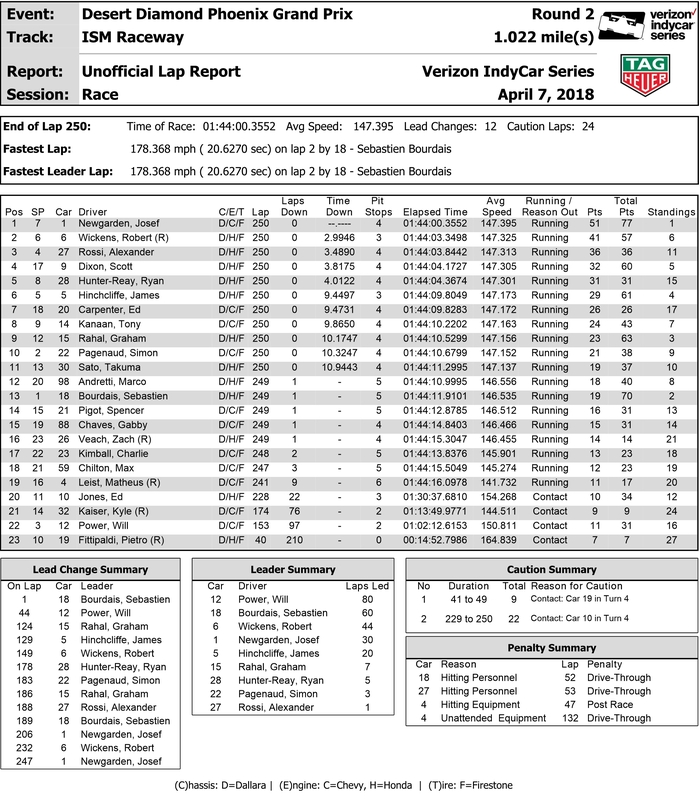 Bourdais finished 13th but Rossi, who made an incredible 53 on-track passes (19 percent of all passes made in the race), charged back to reach the podium. “The only reason I was able to do that was because the team gave me an unbelievable car,” Rossi said. “As I said, we spent so much of our time and brain effort and research in the time between the (February) open test and (race weekend) focusing on tire life. Hopefully, it’s something that we can keep an advantage on people going forward for the next short ovals. The next Verizon IndyCar Series race is the Toyota Grand Prix of Long Beach on Sunday, April 15. It airs live at 4pm ET on NBCSN and the Advance Auto Parts INDYCAR Radio Network.